“Why BRIEF? 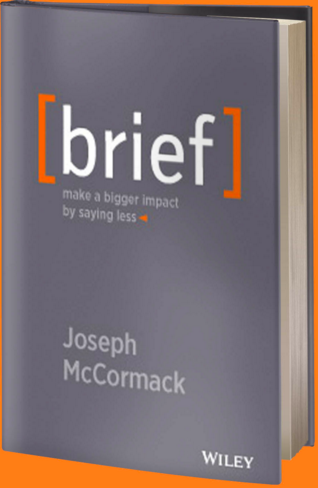 In our attention-deficit economy, being brief is what’s desperately needed and rarely delivered. What, then, is the power of brevity? Brevity demonstrates clarity, self-awareness, applied knowledge, and leadership. Why is it hard to be brief? Brevity takes a solid understanding of what we are trying to communicate and why we are expressing it, the discipline to check our progress, and an awareness of how much is too much or not enough. Here are “seven sins,” or habits , that tend to make people verbose. Note that the language used here is strong! I find I need to prepare myself to be open to examining my habits — my greatest sins are #5 Confusion, and #6 Complication. 1. Cowardice — I don’t want to take a stand. There are a lot of perspectives on that topic. I’m afraid of saying what I need to say. 2. Confidence — I know so much (or in so much detail) that I could talk for days! 3. Callousness — I don’t value your time that much. I say “this will just take a few minutes,” but I assume you can give me more time that that. 4. Comfort — I get on a roll. It feels good to keep talking. 5. Confusion — I’m not clear in my thinking. Bear with me, I am just thinking out loud. 7. Carelessness — I’m not filtering as I talk. I just say things as they come to mind.